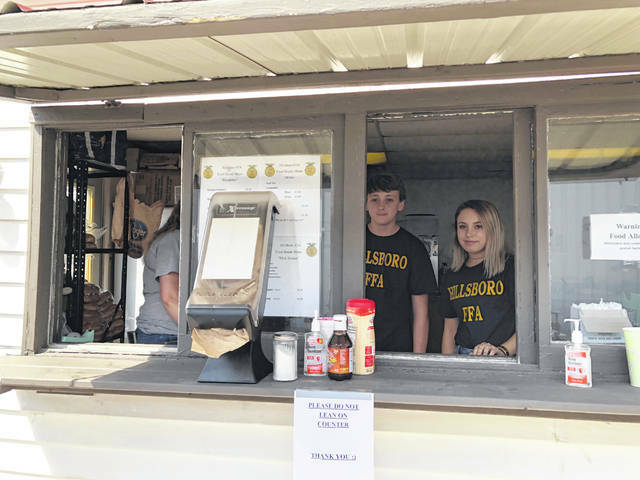 Hillsboro FFA members Logan Helterbrand and Gracie Isaacs are shown working and enjoying their time in the food booth at the fair. Members of the Hillsboro FFA Chapter were at work all week during the 2018 Highland County Fair. Every year the chapter serves food and drinks to visitors at the fair from its food booth. Members volunteer their time to work different shifts to help keep the booth running. The members also learn life skills. They learn how communicate with others, to count change, and responsibility. Most of the work is done behind the scenes. Some of the classes use their free time to help clean, organize and get the booth ready. FFA officers order food, cups, drinks, etc. to make sure that the food booth is stocked with everything needed. This year the members also painted and rebuilt the front shelf on the food booth and put time in for community service. At the end of the week the food booth was successful. The chapter would like to thank all the members and adults who worked in the food booth. Without their help the booth wouldn’t have been successful. Hillsboro FFA alumnigy Bryanna Burkle and Pyper Ross helped run the food booth to keep it up and going. The Hillsboro FFA Chapter would like to thank anyone who helped support it by visiting the booth. Submitted by Kirsten Harp, Hillsboro FFA Chapter. https://www.timesgazette.com/wp-content/uploads/sites/33/2018/09/web1_food-booth-image.jpgHillsboro FFA members Logan Helterbrand and Gracie Isaacs are shown working and enjoying their time in the food booth at the fair.